Spring is definitely in the air. Taffy (even with her Spring hair-do) didn't want to stop to put on a sweater! She was having so much fun playing with her shadow. I grabbed the shot of her barreling down the trail towards me in the bush, and it wasn't until I saw it on the screen that I saw the trail of sparkles in her wake. It was rather a magical day out there, but who knew that Taffy was fueled by Fairy Dust? All ice huts are required to be off the ice by March 31st here. Ours are safe and snug in their 'summer digs'. Now the boats start to get ready to come out. There are still big fish out there, whispering to our fishermen. Just this. A thistle, in winter, against the snow. It makes a lovely picture. 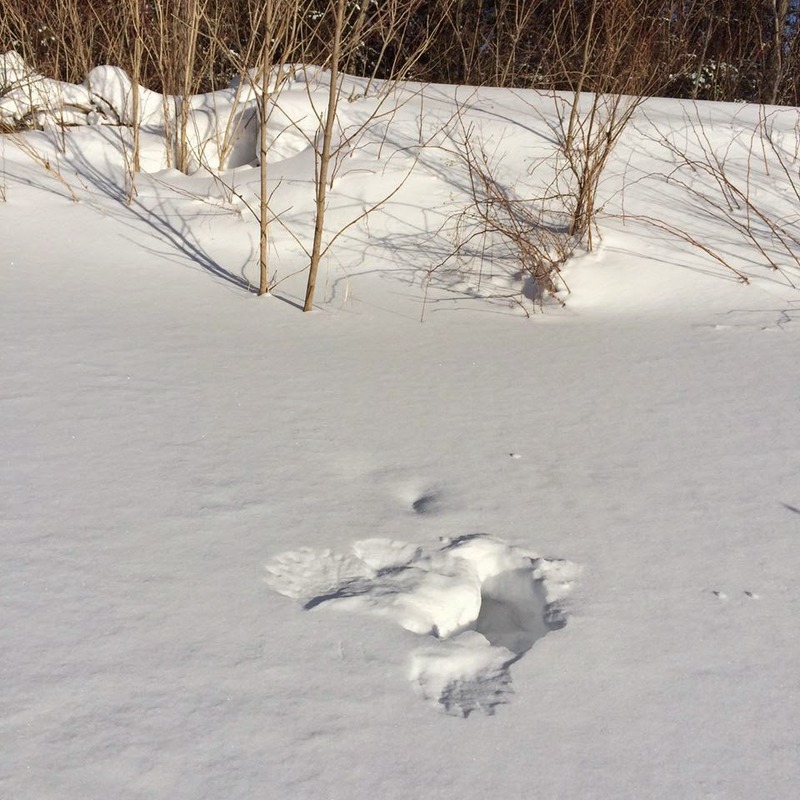 We have bunny tracks all over the place right now. And deer, too. These tracks winding along the waterfront were crossing the rabbit tracks. Hope all the animals looked both ways! hope they're being careful to check the ice, as well! We recently said "good-bye and God Bless" to one of our very long time and beloved Bondi Family members, Christian Jaekl. Today, his daughter-in-law shared with us her words from the funeral. We were so deeply moved to hear that some of the best family moments and memories in his completely beloved grandchildren's minds included the cottage, here at Bondi. We would like to share this eulogy with you, as we remember our friend. And many thanks to Mary for sharing these beautiful words. The first time I met Brendan's dad I was in high school. I'd rung the bell and he came to open the door for me. I only caught a glimpse of him in his nightgown fleeing up the stairs as he hollered for Brendan to come. That might have been the start of the friendly competition Brendan and I had for years over whose dad was weirdest. Eventually we declared a tie, though the kids did dub Christian "Silly Grandpa" so it's possible he had the edge. He might have been silly sometimes but what I remember most is how thoughtful he was. When our household wasn’t feeling well there were often special deliveries of what he called vitamin B (bananas) and vitamin C (grapefruit) delivered despite protests that we would manage. In later years this was joined by C-Boost juice, which he swore was a cure-all. If there was any hint of a chill Christian always had to make sure we were properly covered in sweaters and blankets, especially around the middle. Some might think the spiders hidden under cups in the basement were a diabolical plot but really it was because he preferred to let them out gently into the garden instead of killing them. Christian was a fantastic teacher too and was always ready to share his extensive knowledge, especially about the stock market. He and Brendan could talk back and forth for hours. Despite his obvious abilities, he sometimes flattered me by assigning a little research project for facts he could use for a news article or to convince the condo board to come around to his way of thinking. He was a persuasive man. I love it that his sons look and act a bit more like him every day. There are certainly many Grandpa stories that form our family lore – too many to share here and I’m sure there are still some I haven’t heard yet. He always used to wrap up conversations with me by saying “All the best”. Today it’s my turn. All the best, Vati. We miss you. It is with sadness that we report the loss of one of our dear Bondi family members. Christian Jaekl has been a valued part of our summers for well over 30 years. We watched his children grow up (and up. And up -- well past the six foot mark) And we have watched his grandchildren arrive. His gracious nature, and fierce dry sense of humour will be greatly missed. We have such lovely memories of him here with his family, in the paddleboat, walking our trails and lawns, at the beach with the children... We will miss you Christian Jaekl, more than you might know. We extend condolences to his wife Margaret, sons Chris, Brendan and Mark, to his beloved 'daughters' Mary and Yukiko, and of course to the grandchildren, Erika, Maria, Elizabeth and Matthew. It has been a blessing to know this wonderful man, and a great honour to call him our friend. Christian Jaekl (Adi), born December 8, 1939 in Mahrisch-Chrostau (formerly Austria, now Czech Republic), died March 19, 2015 in Ottawa. Beloved husband for 43 years of Margaret (Clark), loving father of Christian (Yukiko Iwasaki), and Brendan (Mary) of Ottawa, and Mark of Taipei. Doting grandpa of Erika, Elizabeth, Maria, and Matthew. Brother of Josef (Rosalie) of Collingwood, Johann (Herta) of Frankfurt, and Elfriede Sarafidis of Himberg, Austria. After receiving his doctorate in jurisprudence from the University of Vienna, Christian worked as a speechwriter in the Prime Minister’s office before coming to Ottawa in 1967 as Press Attaché (later Counsellor) at the Austrian Embassy. Originally scheduled to spend 6 months in Canada, he ended up staying for 13 years before returning to Vienna as Director of the Documentation Division of the Foreign Office. In 1982 he returned to Ottawa and spent many years as the Canadian political correspondent for the Neue Zűrcher Zeitung, as well as teaching Law at Carleton University and Political Science at the University of Ottawa. Friends are invited to visit at the Central Chapel of Hulse, Playfair & McGarry, 315 McLeod Street (at O’Connor) on Tuesday, March 24th from 6-8 p.m. A celebration of Christian’s life will be held in the Chapel on Wednesday, March 25th at 10:30 a.m., followed by a reception. 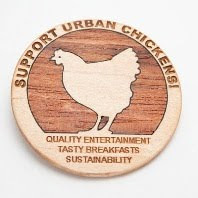 If desired, donations may be made to the Parkinson’s Society or Breast Cancer Action. Taffy loves to climb. Being up on top of things is one of her favourite things -- snowbanks are no exception! This week she found company in her mountaineering, when Lily, 3 and a bit, joined in! Big dreams start with small steps. And it's good to have a friend along, always. Who's coming to dinner, indeed! The staff in Algonquin Park re-located a moose that had been killed on the road. They took the carcass up near the Visitor Centre, where people had the opportunity to watch from the observation deck and see who benefits from the death of one of these huge creatures. Wolves, yes. And fox. Ravens. Eagles. The warm weather causes the snow to start to shift from the metal roofs. It starts with often no warning -- there is a sudden roar, and an avalanche, and the snow comes tumbling down. We are keeping an eye on the garage snow-load, which is gradually working its way towards terra firma. The big Rec Barn shed its snow with a roar on last Friday. The garage is just hanging on. Sometimes, the snow slides more gently. Or in this instance, it gently slides to one side and languishes gently against the side of the shed... Either way, it's a sure sign that Spring is here! The Chamber of Commerce recently hosted a Business at Lunch gathering at the Signal North Gallery, located in the old Train Station in Huntsville. Too many people don't know about this gem -- which makes perfect space of the old Station. The current exhibit with artists Susan Bothelo, Catherine Luce and Patricia Astley is absolutely delightful, with a perfect mix of whimsy and function. I need more wall space... This is on until the end of the Month, so go check it out! 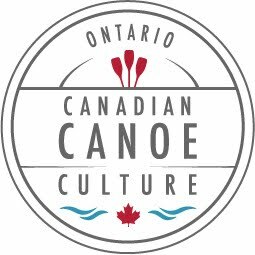 Ice huts have to be off the lake by the end of this month, but in the meantime our ice fishermen are squeezing in any spare time they have to be out there on the lake. 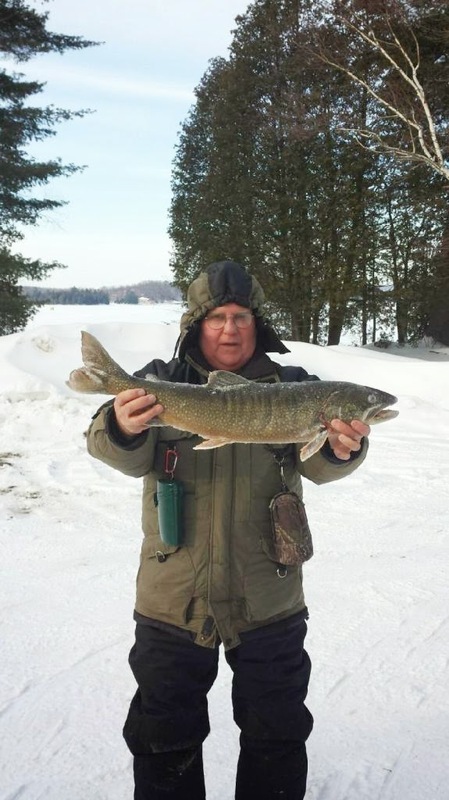 John was rewarded with this beauty, taken off Norway Point, last week. It weighed over 9 lb and measured over 23"! On Feb. 28 we put up a post (with rather graphic photos) of a deer that had been killed by the wolf pack at the edge of our property. There is really no way to make a partially eaten deer look good. It has been a week, and we're adding to that post, to show just how swiftly, and how completely, the wild ones clean up after themselves. 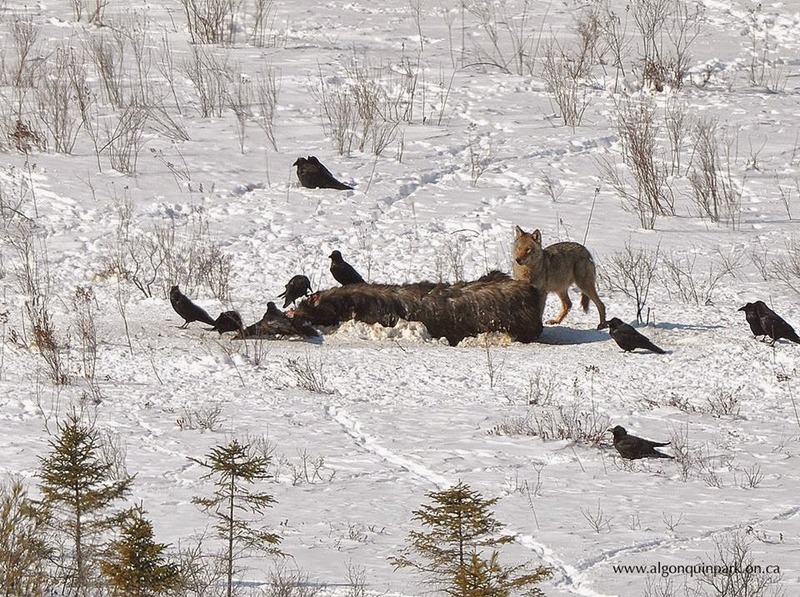 That deer fed not only the pack of wolves, but the local fox, a pair of bald eagles, untold numbers of ravens. This at a time when there isn't much to eat out there, with the land still locked down in snow and ice. At a time when the animals are as tired of the cold as we are, and even more tired of the struggle to find food. So yes, we are sad for the deer, who didn't get to see Spring come this year. But we have to be okay with it, because it is Nature's way, and the means by which the other animals survive. Today, when we walked over to check up on the clean-up efforts, there was nothing left. Nothing. Seriously. Just packed down snow, and some stain. Not even a single scrap of fur remains. Nothing went to waste. We should be so lucky when we describe our own lifestyles. 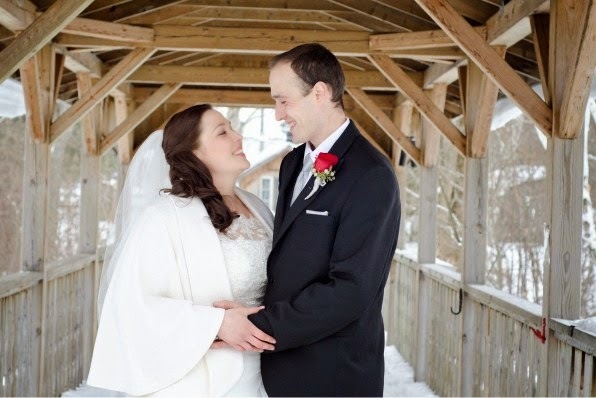 There is always a warm welcome to be found at the Resorts of North Muskoka if you're planning a wedding. 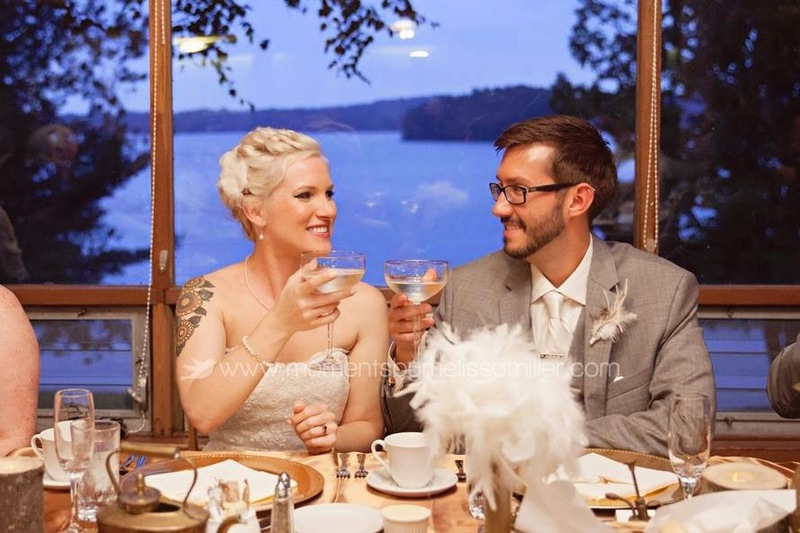 Several of the resorts cater big-time to these special occasions -- Lumina Resort, Port Cunnington Lodge, Tally Ho Inn all come at once to mind. They have big gathering places, excellent chefs and spacious dining rooms to handle the biggest of crowds. 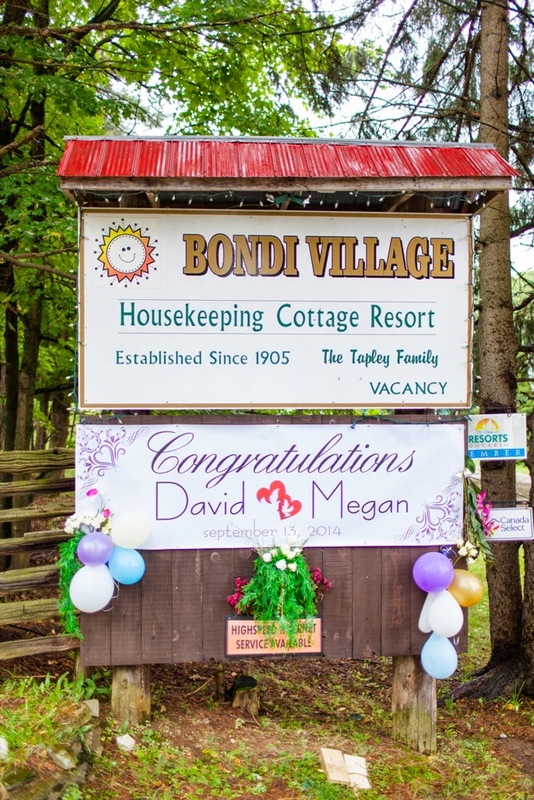 Here at Bondi Village, we are much smaller, and can only handle small groups, but what we do have is plenty of open space and cottages to accommodate guests who are attending the wedding from far afield. 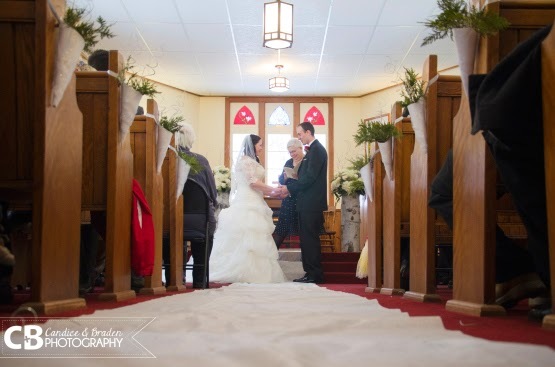 There are people who like to hold their wedding at their family cottage, for example, with a reception at one of the very many places around that can host that -- there are Community Centres that can provide the ideal backdrop. Or Camp Dorset -- which can become so very lovely with a bit of personalized decorating. For these, we offer the accommodation you may need for friends and family. And you will not be able to match the scenery up here for providing fabulous photos to remind you of that magical day. 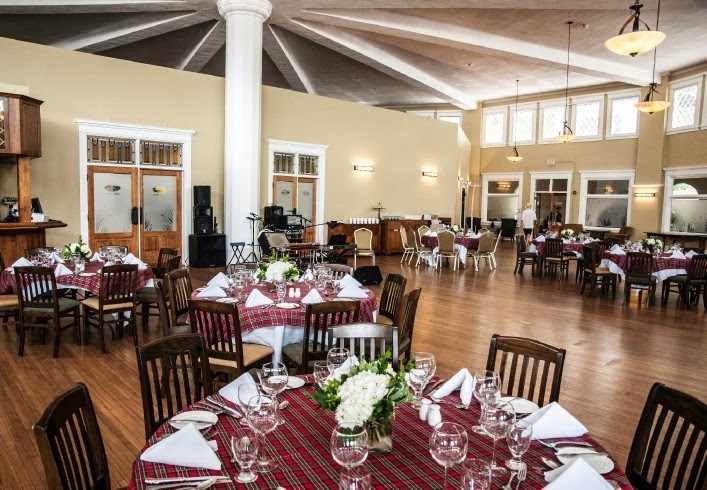 Some weddings "go big" -- the Indian Head Dining room at Bigwin Island Golf Course is one such spectacular venue. 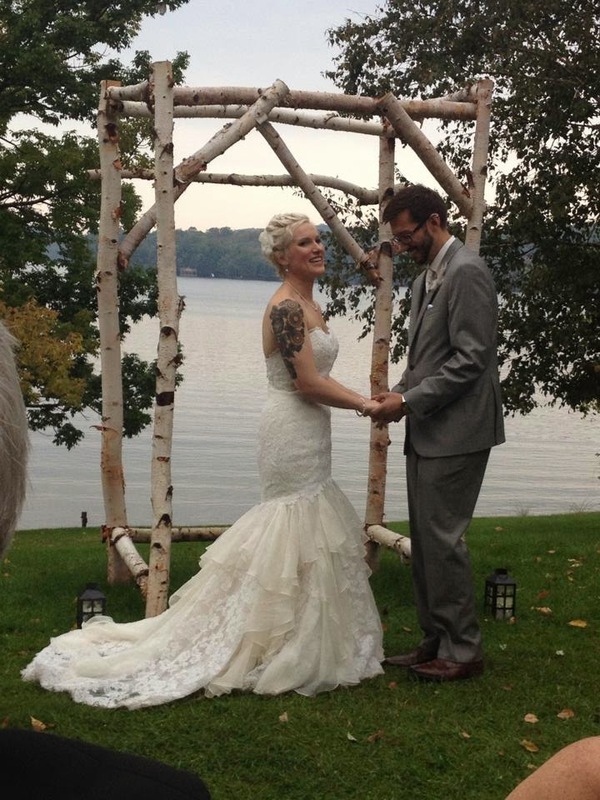 Guests arrive by boat, and what could be prettier than steaming in on the S.S. Bigwin in all your wedding finery? 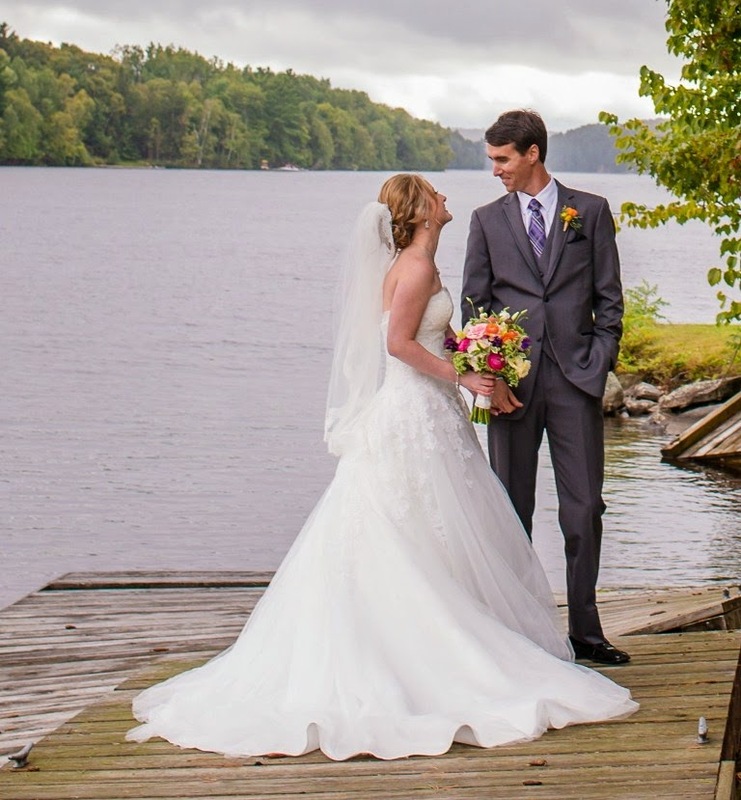 So here, to help get your creative juices on the go, we offer some of our favourite photos from weddings hosted here in North Muskoka. 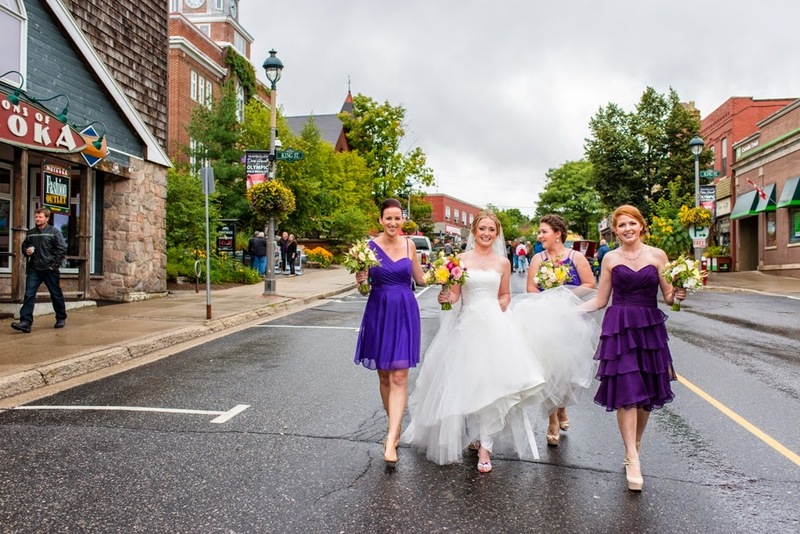 Megan, for example, who was featured on Say Yes to the Dress, Canada, walking down Main Street Huntsville in the middle of the antique car show -- we could hear her approaching the church by listening to the tootling of the car horns that saluted her! There are as many venues as there are wedding ideas, so you are sure to find the one that is the perfect fit. How is this for a backdrop? 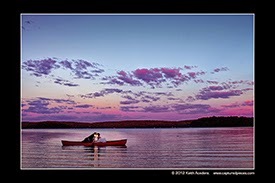 Port Cunnington. Go beat that for a sunset! Every season offers its own special charms for weddings. And every wedding is as unique as the bride and groom at the heart of them. Spring, when all the trees are in blossom... Summer, well, summer. what more need we say? 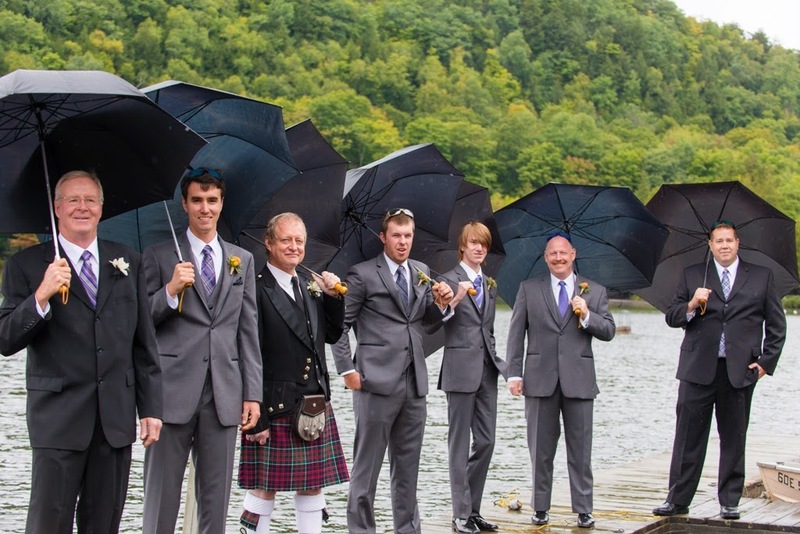 Autumn is one of our favourites, as the colours in the trees complement the colours in the wedding party. 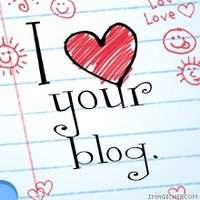 So go ahead and have a wonderful time planning your wedding day. And keep us in mind. Kristin and Jeff at Lumina Resort. At Bondi, while we can only handle very small intimate wedding groups, but we can certainly help you out if you need accommodation! Our friends and neighbours at the resorts up here will be more than able to cater to your particular wedding plans. And everyone here will work hard to ensure you get your 'happy ever after'. It's March!!! Spring is coming. So is March Break. It's a great month to Take Back Winter, and get the kids off the electronic toys and into the real world. and lots of snow for the little angels in your lives. 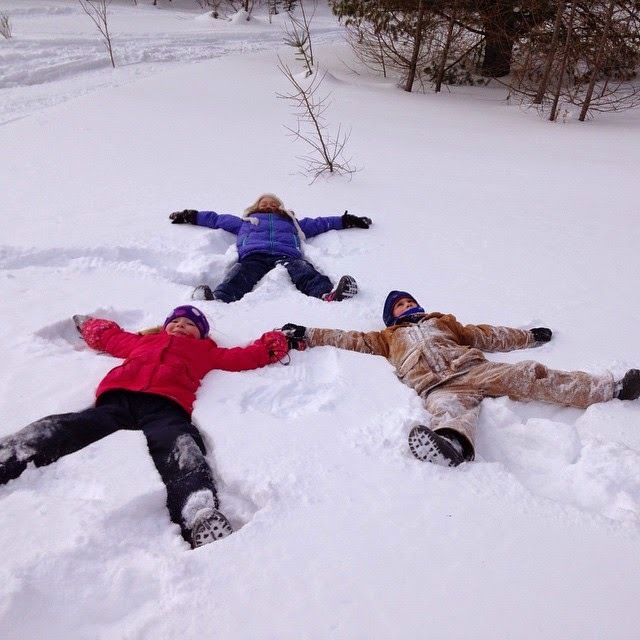 Head to North Muskoka for the March Break. I just had to share this photograph, taken by our cousin Robin Tapley, of Robin Tapley Nature Trails. 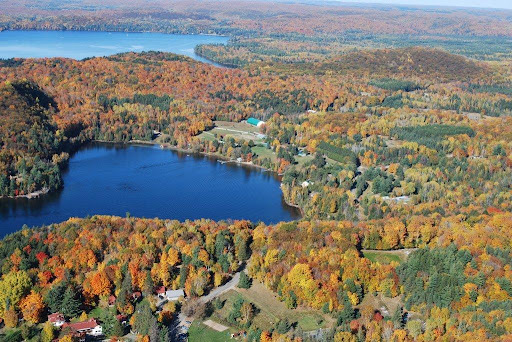 He's spending a lot of time in Algonquin just now, conducting nature programs at the Algonquin Wildlife Research Station. And he always has a camera. Always. His comment on this picture? "Gotcha. Finally." If you go out with Robin on his Nature Trails programs, you get the chance to see wildlife of all sorts. It's about knowing where to go, how to go there, and how to look. 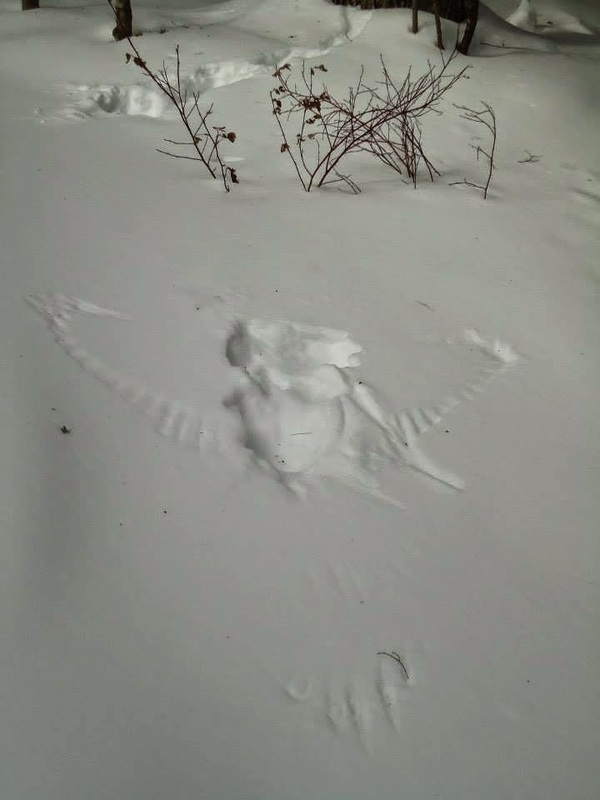 deeply the talons drove down into the snow. Some of our friends had 'visits' today from the owls -- how do we know? Because they found these fabulous tracks in the snow today while they were out in the sunshine. 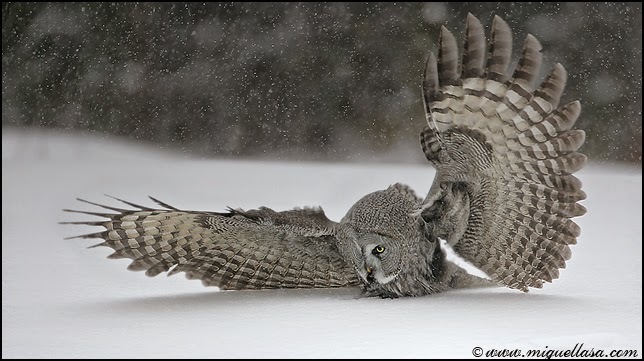 Owls are incredible hunters. 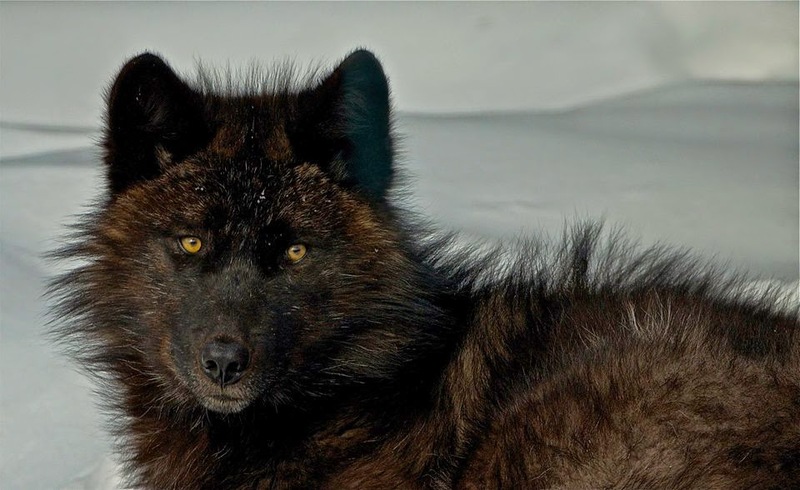 In winter, their prey -- often mice -- are underneath the snow. Often fairly deep underneath the snow, hurrying here and there through little tunnels, insulated from the wind and the worst of the weather. Invisible. The owl's face is designed to catch sound and channel it to the slightly offset ears -- which lets the owl identify with scary accuracy the origin of the sound. The acute vision isn't much help when dinner is hidden under the tablecloth, so to speak, but those ears... well... they'll do quite nicely, thank you very much. 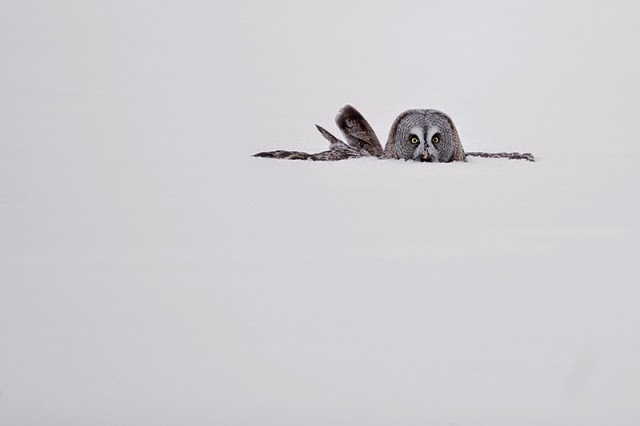 On absolutely silent wings (the feathers are fringed and make no noise coming through the air) the owls swoop in, and strike talon-first into the snow. They'll drive in hard, because they have to get all the way down to where the mouse is unsuspectingly roaming along. It's another great reason to Take Back Winter. Especially during March, as Spring creeps ever closer and the temperatures get mild, being outdoors is an absolute joy.